Pure Hair in Leamington is thrilled to introduce the breakthrough Bamboo collection by award-winning, luxury hair care brand Alterna – Katie Holmes and Victoria Beckham are raving fans so need we say more? Bamboo is the ‘sister’ collection to the highly successful Alterna Caviar Anti-Aging range which effectively repairs and protects hair from chemical treatments, ageing and environmental aggressors. The revolutionary solutions provide beautiful, professional results with natural, certified organic ingredients which are ethically sourced. The high-performance range contains no parabens, sulphates, phthalates or harsh additives and is never tested on animals. Plus lots of our clients agree the range smells amazing. Bamboo is described as one of nature’s most resilient natural ingredients as it is rich in essential vitamins, minerals and amino acids and can dramatically strengthen and boost the flexibility of your hair. Which Alterna Bamboo products are right for you? Frizz is a common hair complaint but you can eliminate the stress with this effective cleansing duo. The gentle formulas smooth away frizz, tame split ends and infuse each strand with intense hydration. Hair is left so much softer and more manageable. Heat styling can play havoc with your hair causing your locks to feel, dry, frizzy and prone to breakage. This intensely protective spray is clinically proven to reduce breakage by 87% due to its ability to repair and strengthen brittle, damaged hair. It also provides maximum thermal protection, shielding hair from temperatures of up to 220°C. Perfect for those who can’t live without their straighteners. A lightweight, instantly absorbing mist which eliminates unwanted frizz, shields hair from heat damage and enhances shine. The all-rounder spray can be used as a style primer or stand alone treatment to boost your hair’s health and condition. The Bamboo Colour Hold+ line of products all contain the patented Color Hold® UV+ technology which includes a wash resistant UVA/UVB formula and promises 8 times more UV filter and 5 times more natural resistance against colour wash out. The mask protects and prolongs vivid shades by deeply nourishing and repairing severely damaged hair. Soothing distressed strands, the intensive treatment shields locks from further stress, sun damage and helps prevent colour fade; keeping your hue fresh and vibrant. Rescue limp, lifeless hair with this award-winning lightweight spray, clinically proven to improve volume by 105%. Containing organic Maca Root which stimulates hair to make it look and feel fuller, your tresses will be left full-bodied, thickened with a visible shine for up to 48 hours. Your hair will be super bouncy but also incredibly soft and never stiff or crunchy. A dazzling smoothing cream which illuminates lack-lustre locks by providing a thin layer of mirror-like shine. An extremely nourishing leave-in treatment which glosses the hair surface leaving it incredibly shiny and brilliantly radiant. The styling essential controls flyaways and frizz whilst Color Hold® technology retains colour, keeping your hair striking. 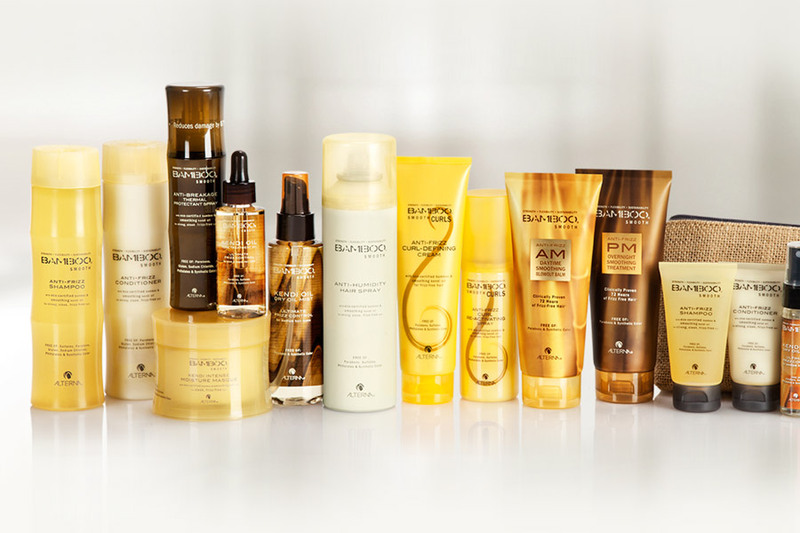 The Alterna Bamboo collection is now available in salon. For more information on how Alterna can transform your mane speak to one of our expert stylists.